Not such a great photo, but try getting one to hold still! A couple weeks ago I was hiking down the trail toward the truck, and heard small claws on tree bark. I slowed down and turned my ears and eyes upward to see if I could detect the scrabbler. It was a Douglas squirrel skittering up a large hemlock tree. As I watched from the ground, the critter eyeballed me and went back to its business climbing up to a knothole. With its rear half sticking out of the hole, it was intently engaged on something…food storage or nest-tending. 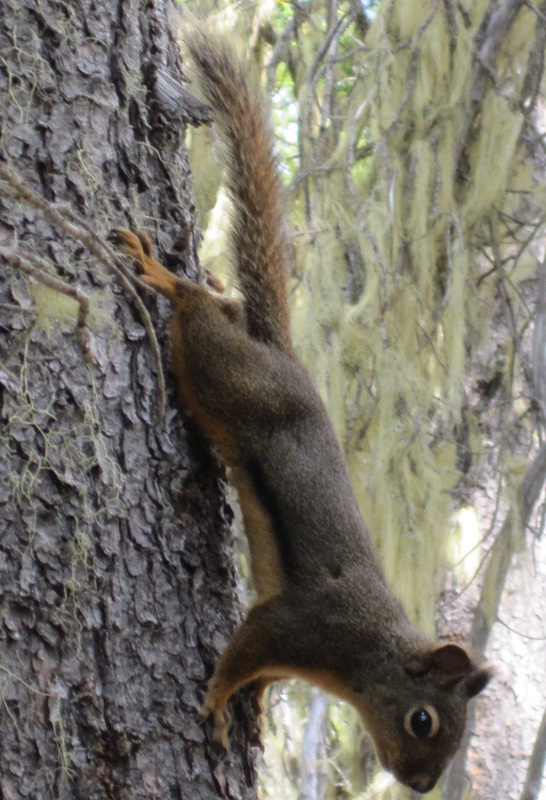 Douglas squirrels do not hibernate in the winter like their chipmunk and ground squirrel cousins. Staying awake during the dark cold means stashing food, and squirrels are experts. In the late summer and fall, conifer cones are ripening. Cones hold seeds, and are designed to open while still on the tree. Seeds are full of protein and energy. Up in trees, squirrels cut the nearly ripe cones from the ends of branches. Down on the ground, they gather them up and put them in hiding places to be eaten later. The cones are methodically dismantled to get at the seeds, and the scales that hold the seeds are discarded in a midden. Finding a big pile of cone scales in the woods means that you have discovered a squirrel dining room. Squirrels are also fond of certain mushrooms, and store dried ones in branch crotches. I have just started a week of vacation. Besides food-stashing, there will be some nest-tending. A wild person has been eating and sleeping here all summer, tracking in dirt, sawdust, and silver fir needles from the woods. She has left some of her work gear in a state of disrepair. Dust bunnies lurk under the refrigerator. Outside, projects that were abandoned in June are waiting to be picked up. The hours of daylight have shortened, but there is still plenty of sunshine and warm weather to be taken advantage of. The bee-sisters fly around the garden, then back to the hive with their back legs laden with golden pollen. The cats sleep belly up through the heat. I might do some of that too, when I’m not moving in the direction of painting the house, picking huckleberries and drying peaches. And finding new ways to eat fresh green beans! PS–Don’t forget to enter Fieldwork’s second anniversary giveaway by sending me an email or a comment. I’ll draw a name on Friday, September 16th. It’s great to know you are squirrely, too! Today, I made raspberry and huckleberry/raspberry jams. I left the dust bunnies alone this weekend, though. I had a busy week with band activities with Tessa and helping a friend pack and sort in preparation for her move at the end of the month. The Western Art and Design event was in Jackson last week so my friend and I attended the fashion and jewelry show Thursday and walked through several art galleries Friday night. Talk about inspiring! I have several ideas for jewelry I need to sketch out. Don’t forget to put your feet up for a little while during your vacation… I find it rejuvenating to relax and review my accomplishments.